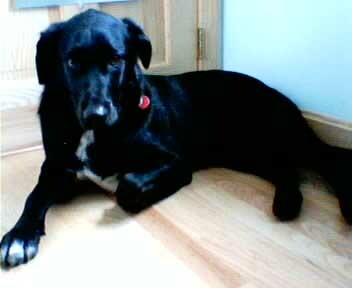 I wonder if you remember Buddy..we adopted him in May 2003. As you may remember, our yard was not fenced in and we didnt have a run... now we have both. We absolutly love him, and he seems to love everything.. including trucks, bikes, rollerbladers, and of course snow! He loves other dogs, although he does play rough, but he is like an angel in the house. He becomes attached to anyone who enters our house, and acts a watchdog to let us know when some one is coming. He spends much of his mornings sleeping on his bed, and then of course on one of ours. He goes to sleep early, by his own choice, and wakes up early, again by his own choice. We love him soooo much and cannot give enough thanks from you guys at Save A Dog. We have attached a picture of him, he was slightly afraid of camera.